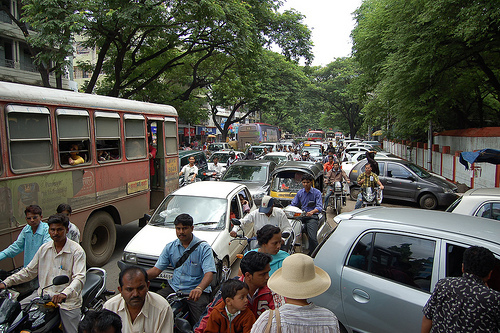 Pune is trying to find solutions for its heavily congested streets. Photo by Ted. The Maharashtra Government approved the Pune Metro Rail a couple of weeks ago, but critics are still concerned about whether or not the project is a suitable solution for Pune’s traffic problems. Last month, the Pune Municipal Corporation’s initial enthusiasm for a new metro system was temporarily dampened by some revealing studies on the metro rail proposal. The two-part study, published by advocacy group Parisar, found weak statistical analysis, faulty data, less than thorough decision-making, and a more pressing need for improvements to the city’s non-motorized transportation facilities. Despite Parisar’s efforts to convince the government to re-consider the metro rail proposal, the project seems to be moving ahead as planned. Situated in the western mountain range of the Ghats, Pune is the eighth largest metropolitan area in India, and it hosts a rich array of political, cultural and industrial establishments. Already housing a public, intra-city bus system, known as PMPML, and both a rail and highway system for regional transit, the city has displayed an eagerness to create a new metro rail system for improving transportation within the city. In January, these efforts materialized into a formal proposal for a new metro system that contained secondary data from three reports: the detailed project report (DPR) prepared by Delhi Metro Railway Corp. (DMRC), a traffic demand analysis, and the city’s Comprehensive Mobility Plan. The overarching conclusion of the PMC report was to move forward with the Pune metro rail project. The proposal was supposed to be sent to the national government within 15 days of state approval. But the metro rail project has sparked much debate, as has been the case in many other Indian cities. Critics point to metro’s increased potential to encourage sprawl, exorbitant costs and lack of integration with other transport modes. Last month, Parisar completed two in-depth studies on Pune’s metro rail proposal. The first study examined the validity of PMC’s conclusion that a metro rail system was appropriate—a justification apparently based only on one metric: peak hour traffic demand exceeding 20,000 in one direction. Parisar found that the analysis wrought with “questionable” data, and consequently, requires further investigation. The first study can be downloaded here. The second Parisar study examined the decision-making processes of PMC and how the proposed rail system would translate to socio-economic benefits for the people of Pune. The study claims there were several “ad hoc decisions,” such as extending the Vanaz-Ramwadi corridor to Kharadi and the airport. From a socio-economic perspective, Parisar concluded that the proposed metro system is “likely to be harmful” to the majority of Pune’s citizens. The second study can be downloaded here. “Parisar believes that the current proposal must be rejected, and any proposal for a system such as a metro must only be approved after a thorough analysis of its benefits and costs. Until then, the PMC must focus on faster and cheaper solutions such as improving the Pune Mahanagar Parivahan Mahamandal Ltd (PMPML) and conditions for pedestrians and cyclists,” he said. Parisar is definitely not alone in its criticisms. In April last year, activists formed a group known as Pune Metro Jagruti Abhiyaan (PMJA) “to create public awareness about the metro proposal so that people understand what is being planned and what will be the impact.” They wrote a letter voicing their concerns, demanding transparency and accountability from the government. The activists wanted assurance about the metro’s cost-effectiveness and integration with existing transportation. They questioned the feasibility of an elevated “flyover” metro corridor. They wondered about the lack of parking spaces for private vehicles. They worried about the demolition of historic buildings. The list of requests and questions continued. Along with PMJA, other NGOs and advocacy groups are calling for a public hearing to study “the ‘haphazardly and disastrously’ planned Pune Metro Project.” Political pressure is mounting, especially considering the upcoming February 2012 elections. The metro project also stirs controversy over land use issues. For example, the Delhi Metro Rail Corporation proposed a metro station at the same site of the Shivsrushti cultural center, which includes a portion of the proposed bio-diversity park in Kothrud, a southwest suburb of Pune. Adding to the metro project’s hurdles is the fact that Pune has been left out of the plans for the Integrated Suburban Railway Networks (ISRN). Some fear that this will jeopordize the city’s ability to advance the metro project and improve overall transport and rail infrastructure. Meanwhile, Pune did not receive any new funding under the Jawaharlal Nehru National Renewal Mission (JNNURM), a nationwide plan to improve urban development projects, including transportation. The city’s Finance Minister Pranab Mukherjee suggested other streams of funding for the metro project, like public-private partnerships. As debate about Pune’s metro rail project heats up, another public transport discussion is cropping up: how to upgrade the city’s existing “bus rapid transit” system, which still does not include many of the features of a high-quality, full BRT, such as the Janmarg system in Ahmedabad. Jeffrey Riecke contributed to this post. Metro Rail: The Solution for India?